Welcome to this bumper edition of Dancing Times which, in addition to all our usual outlets, can also be seen by a projected 20,000 visitors at MOVE IT, the annual dance exhibition held at Olympia in London from March 7 to 9, and for which the magazine has been a media sponsor since its inception. 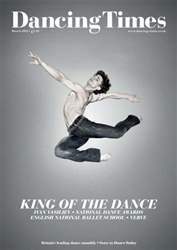 This month, we talk to ballet superstar Ivan Vasiliev on the eve of his appearance at the London Coliseum in Kings of the Dance alongside four other male ballet stars, as well as former Bolshoi ballerina Svetlana Lunkina. Vasiliev talks about the freedom he has found since becoming a freelance dancer, and reveals that one role on his wish list is Crown Prince Rudolf in Kenneth MacMillan’s Mayerling. In addition, we take a look at the work of Verve, the postgraduate dance company based at the Northern School of Contemporary Dance, and celebrate the 25th anniversary of English National Ballet School. We also review a wide-range of recent dance performances, including Natalia Osipova’s debut in The Royal Ballet’s production of Giselle (see also Letters), as well as two new London shows, Drunk and Stephen Ward. Finally, we reveal the winners of the National Dance Awards, including the Dancing Times Award for Best Male Dancer.